Tribune Digital Ventures bought ratings resource TV by the Numbers for an undisclosed sum and hopes to parlay its information into additional revenue streams. Graham McKenna, the company's vp of marketing and communications, told Adweek that it is considering the possibility of selling the TV metrics from the site to industry insiders. Tribune Digital Ventures is also looking at expanding TV by the Numbers to include information on how social media influences people to watch certain shows. 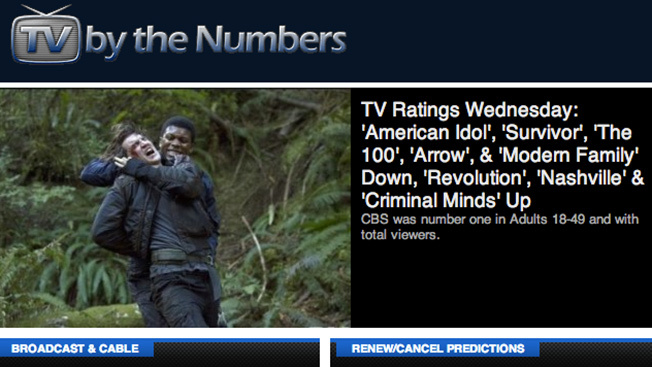 The way the site is written right now, the content speaks to both Hollywood business moguls and the casual TV watcher. McKenna said in the future that a “deep dive into data” may be released as a newsletter directed towards the b-to-b community, but the company plans to retain the consumer-directed articles in a separate iteration. Since the Tribune Company launched Tribune Digital Ventures a mere 10 months ago, the company has already made some interesting moves. In December 2013, it announced the acquisition of Sony's music database Gracenote. It also released audio-based news app Newsbeat. McKenna added that Tribune Digital Ventures has been interested in adding additional data inputs and sources in order to expand the licensed data side of its business. Today’s announcement was also coupled with a relaunch of entertainment news site Zap2It. Zap2It has been a member of the Tribune Company since 2000, and has had an affiliate partnership with TV by the Numbers—which was previously owned by creators Bill Gorman and Robert Seidman—since 2010. It attracts more than 7.5 million monthly users. The site’s webpage was updated to be more in tune with smartphone and mobile platforms. Users will find a much more image-driven and organized experience, but the editorial structure will remain the same for the time being. Tribune Digital Ventures is looking for additional content sources to bolster coverage. “It’s a cleaner and easier to navigate for people sitting in front of their TV. We want them to have a good mobile experience,” McKenna explained.